Summary: With concepts of single-feature linear-regression, cost function, gradient descent (from Part 1), epoch, learn-rate, gradient descent variation (from Part 2) under our belt, we are ready to progress to multi-feature linear regression with TensorFlow (TF). If you are already familiar with matrices and multi-feature linear regression, skip to the end for the multi-feature Tensorflow code cheatsheet, or even skip this entire article. We find a straight line (linear regression) that ‘best-fits’ the data points that we have. The ‘best-fit’ is when the linear regression line ensures that the difference between the actual data points (gray dots) and the predicted values (gray dots interpolated on to the straight line), which, in other words, is the sum of multiple blue lines, is minimized. 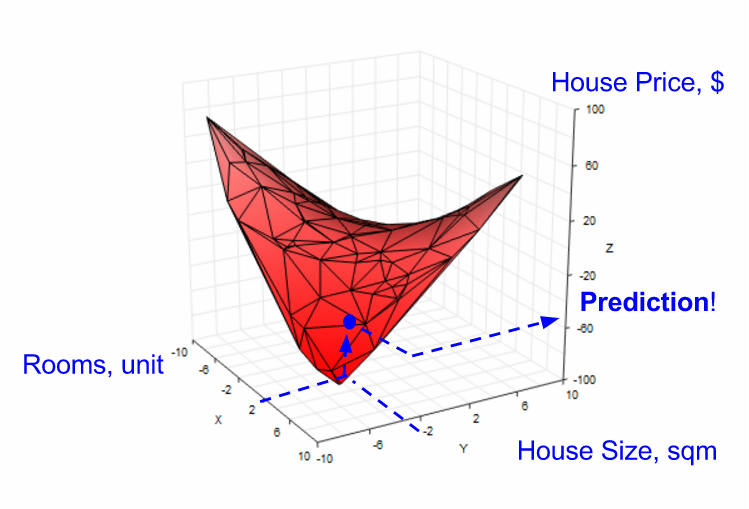 In reality, any prediction relies on multiple features, so we advance from single-feature to 2-feature linear regression; we chose 2 features to keep visualization and comprehension simple, but the concept generalizes to any number of features. We introduce a new feature, ‘Rooms’ (number of units in the house). When collecting datapoints, we must now collect values for the new feature ‘rooms’ on top of the existing feature ‘house size’, as well as the corresponding outcome ‘house price’. Our goal then becomes predicting ‘house price’, given ‘rooms’, and ‘house size’ (see image below). 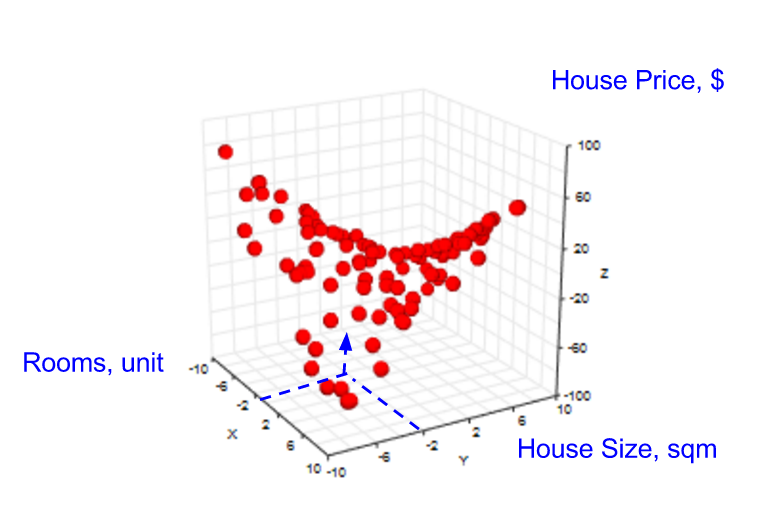 In the single-feature scenario, we had to use linear regression to create a straight line to help us predict the outcome ‘house size’, for cases where we did not have datapoints. In a 2-feature scenario, we can also employ linear regression, but to create a plane (instead of a straight line) to help us predict (see image below). 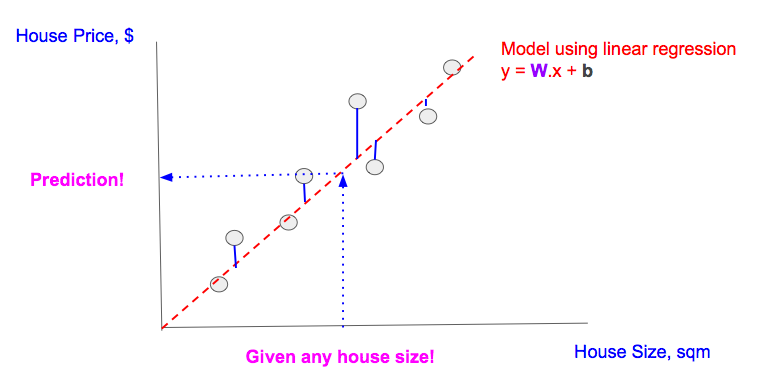 Recall for a single-feature (see left of image below), the linear regression model outcome (y) has a weight (W), a placeholder (x) for the ‘house size’ feature, and a bias (b). For 2-feature (see right of image below), we introduce another weight, which we call W2, and another placeholder, x2 to hold the ‘rooms’ feature value. When we perform linear regression, gradient descent helps us learn the additional weight W2, on top of the learning W, b as previously discussed. The change to support 2-feature linear regression equation (explained above) in TF code is shown in red. Note this way of adding new features is inefficient; as the number of features grow, the number of required variables and placeholders increases. In reality models have many more features, which worsens this problem. How can we represent features efficiently? NOTE: For W we use tf.zeros, which initializes all W1, W2, …, Wn to zeros. Matrix multiplication between a multi-row feature matrix (each row representing a datapoint’s n features), returns multi-row outcomes (each row representing the outcome/prediction (without bias added) of each datapoint); thus a single matrix multiplication can apply the linear regression formula to multiple datapoints to produce multiple predictions, one for each datapoints, at a single go (see below)! Note: The x representations in the feature matrix become more complex, i.e., we use x1.1, x1.2, instead of x1, x2, etc. 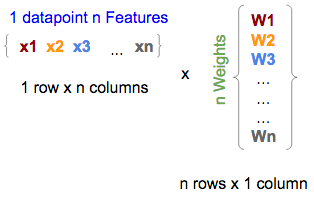 because the feature matrix (the one in the middle) has expanded from representing a single datapoint of n-features (1 row x n columns) to representing m datapoints with n-features (m rows x n columns), so we extended x<n>, e.g., x1, to x<m>.<n>, e.g., x1.1, where n is the feature number and m is the datapoint number. We illustrated the concept of multi-feature linear regression, and showed how we extend our model and TF code from single to 2-feature linear regression models, which is generalizable to n-feature models. We conclude by presenting a cheatsheet for multi-feature TF linear regression model. We will present the concepts of logistic regression, cross-entropy, and softmax, which will enable us to fully understand Tensorflow’s official beginner’s tutorial on MNIST.